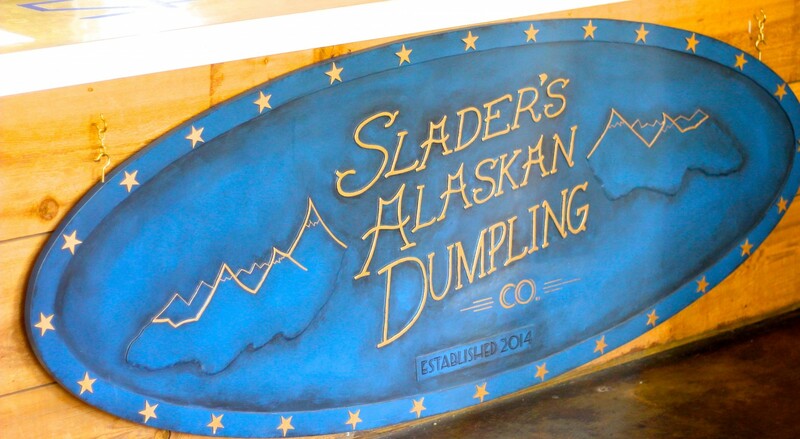 Ever tried “Alaskan Dumplings?” I hadn’t either until a recent trip up to Searcy and a visit to Slader’s Alaskan Dumpling Company. It’s a small, brightly-colored blue-and-gold building just off the Harding University campus, owned and operated by a young, Alaska native named Slader Marshall. Marshall has been building a loyal following at his dumpling house (also affectionately known as “SADCo.”) over the last year since opening in January 2014. But with some upcoming changes in his life (namely marriage and home ownership), Slader is preparing to bring his Alaskan dumplings to Little Rock with his SADCo. food truck. Slader was born in Arkansas but moved to Juneau, AK at a very young age. Juneau is a fairly isolated city—it’s difficult to get much into or out of the place—and so most of the restaurants and cooking focuses on locally-sourced, home grown products, and most shops are individually-owned, family based operations. Alaskan dumplings, also known as “pel’meni,” are an important part of Alaskan heritage…originally brought to the state by Russian settlers decades ago. They’re served in restaurants all over southeast Alaska. Slader grew up eating them, and cooking them, and now serves his own variation of this Alaskan staple at his Searcy restaurant. His menu is simple…beef, chicken, or potato dumplings, doused in butter, sriracha, and cilantro, with a scoop of sour cream. On the side, some toasted bread and a drink. It’s a dish you’re unlikely to find anywhere else in Arkansas. Slader plans to move to Little Rock within the next few weeks. He’s already got a truck in working order that he’s still tweaking to fit the needs of his dumpling operation. He hopes to hit the street of central Arkansas by March or April. His homemade dumplings are clean, simple, and portable and will make and excellent addition to Arkansas street food. The restaurant in Searcy will remain open and continue to be a regular gathering place for Searcy residents and Harding students. Its unique, laid-back vibe makes it the ideal gathering place for live music and for meeting with friends and it’s already playing an important role in the local food scene. Keep up with Slader’s Alaskan Dumpling Company on Facebook for all the latest developments.